Two simple bookcase projects. Both are designed to be made from 1x12 pine boards. Use plywood or beadboard for the back. 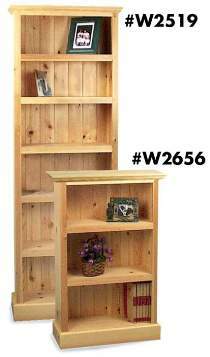 Small bookcase measures 41 inches high x 26 inches wide x 10.5 inches deep. Large bookcase measures 72.75 inches high x 25.5 inches wide x 10.5 inches deep. All parts are drawn to scale.